Appointments validated: liquidators Gus Gordon and Michael Hird leaving the Supreme Court on monday with their appointments validated. Andrew Wily: has launched an application seeking to confirm his decision to utilise section 499(5). 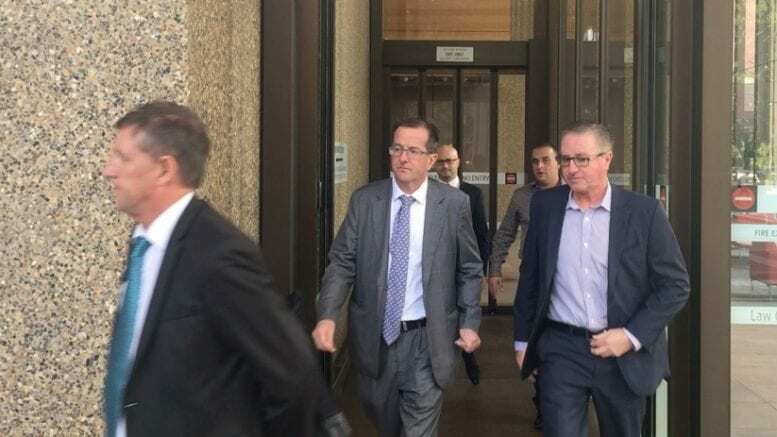 Liquidators Angus Gordon and Michael Hird waltzed from the NSW Supreme Court on Monday with a spring in their collective step, the latter unimpeded by an impressive shiner around his right eye. The buoyancy being exhibited by the Macquarie Gordon pair followed declarations made moments earlier by Justice Paul Brereton, who effectively confirmed they had been validly appointed as joint & several liquidators to approximately 20 companies formerly controlled by Andrew Hugh Jenner Wily, who had resigned en masse ahead of the expiration of his liquidator’s registration on April 24. The pair had consented to act and attended at a series of meetings held between April 17 and 19. But on the final day ASIC advised that it was not satisfied the meetings, called by Wily under Section 499(5) of the Corporations Acts, had been properly convened. Questions arose. Was Wily’s resignation valid? If not, what did that make of the replacements’ appointments? During a break in the Traill & Associates practical insolvency conference yesterday SiN was told by interested observers there was no problem with Wily convening under section 499(5) and the regulator had it wrong. Ultimately a judge will decide as Wily has filed an originating process seeking to have the question resolved once and for all. Why does he care? So he can confirm his right to remuneration voted on at some of the meetings. Interestingly, certain of SiN’s sources – temporarily domiciled in Fiji – implied that ASIC’s concerns were related not to the manner in which the meetings had been convened but were focussed around determining if some remuneration was paid without creditor approval. All the meetings took place the week prior to the expiry of Wily’s liquidator’s registration and most assuredly, Wily took advice. SiN contacted the man himself for comment but no response was received prior to this publication’s deadline. Wily has however made an application in the Supreme Court seeking a declaration that he was correct to utilise section 499(5) to facilitate his resignation, to appoint replacements and, in certain cases, obtain creditor approval for his remuneration. The matter returns to court on May 15. In the meantime, Justice Brereton on Monday had no problem ruling that Wily be removed as liquidator from the bulk of the companies listed in the schedule and that Gordon and Hird replace him. And that shiner Hird was sporting? It was apparently caused by that most ubiquitous of all of the culprits generally invoked to explain such a wound. The kitchen cupboard. 1 Comment on "Judge confirms appointments of Gordon and Hird"